Maybe not really rules, maybe just guidelines. Ideas and advices that will help to make the best of the situation. Like perhaps not cut down a shrub when it's in full flower. Which is what I've done today. And I normally wouldn't. I totally get that most plants have a time where they are flowering and looking beautiful and other times where they aren't and are therefore living closer to the edge of that dangerous world of shovel prune! But this was a plumbago. Of which there are three in the front garden, or at least there were three, now there's two. Which is probably still one too many for me. One thing about plumbago, I don't know a single garden that has only one. Because one plumbago soon becomes a clump of many, many stems and then shortly thereafter, a new little plumbago emerges a few metres away on that side, and another one over on that side, and a couple more out in the lawn, and so on and so on until a hedge of plumbago exists where once a single plant stood. Suffice to say, it's not my most favourite shrub. I hate the sticky bits. But I do appreciate the flowers, which look like little pieces of the most perfect blue sky. And the butterflies love it. And the frogs croak out of it when it rains. But it had to go. So I started snipping, ever mindful of the probable existence of a wasps' nest inside, which I eventually found when they buzzed at me and sent me scurrying in for the can of Pea-beu. They are such aggressive creatures, they fly right at you, one I swept out of my hair before it had the chance to sting me. Being on the lookout for them in any reasonably sized plant that hasn't been disturbed for a while, like with a good prune or something, is something I've learned since gardening here. There was actually two nests, this old one which looks like it has served it's purpose and another new one being built and being aggressively guarded. After I snipped this one off the shrub, I put it on the garden wall and the ants came in an absolute swarm. So plumbago removal looks like keeping me occupied for the next couple of days. I will soldier on with the job, because I have plans in my head to replace the plumbagos with my Angel Face roses and purple vanilla-flavoured heliotropes and white agapanthus. Here's an audition of the plan. That works for me! And which side of the driveway is this happening on - why, on the western side! The opposite side to where I planned first to plant the new roses. 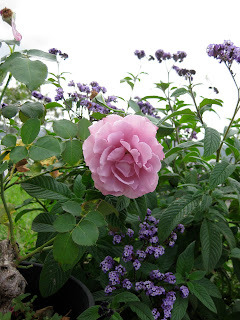 I lined up the pots on the eastern side and sat there and contemplated the look of the pinky-mauve roses in front of the hedge of Robyn Gordon grevilleas that already exists in the eastern bed and it was not sweet music! There's something about our native flora - and fauna for that matter - everything screeches at you, be it cockatoos or galahs or grevillea flowers! And that's the wonderful thing about gardening and the rules thereof! You make them up as you go along and then you are perfectly entitled to change your mind and disregard them completely. Could there be anything better?